What Makes the Church Grow? 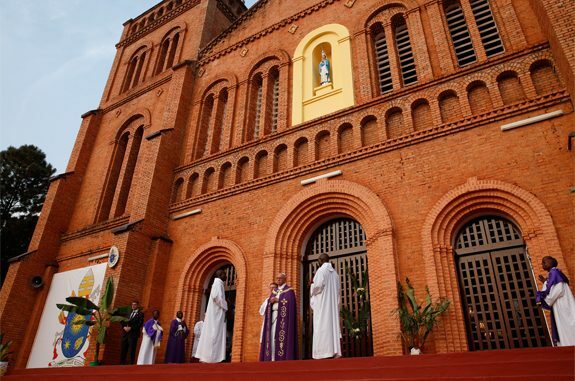 Just recently on the website maintained by the episcopal conference of Germany there appeared an editorial concerning Pope Francis’s apostolic visit to Africa. As many have pointed out, the piece was breathtaking in its arrogance and cultural condescension. The author’s take on the surprisingly rapid pace of Christianity’s growth on the “dark continent” (his words)? Well, the level of education in Africa is so low that the people accept easy answers to complex questions. His assessment of the explosion in vocations across Africa? Well, the poor things don’t have many other avenues of social advancement; so they naturally gravitate toward the priesthood. What made this analysis especially dispiriting is that it came, not from a secularist or professionally anti-religious source, but precisely from the editor of the official webpage of the Catholic Church in Germany. It is no accident, of course, that the article appeared immediately in the wake of a very pointed oration of Pope Francis to the hierarchy of Germany, in which the Holy Father indicated the obvious, namely, that the once vibrant German Catholic Church is in severe crisis: its people leaving in droves, doctrine and moral teaching regularly ignored, vocations disappearing, etc. Thus it might be construed as a not so subtle shot across the Papal bow. But it was born too, I think, of an instinct that is at least a couple of hundred years old that northern Europe — and Germany in particular — naturally assumes the role of teacher and intellectual leader within the Catholic Church. In the nineteenth century, so many of the great theologians were Germans: Drey, Döllinger, Mohler, Scheeben, Franzelin, etc. And in the twentieth century, especially in the years just prior to Vatican II, the intellectual heavy-weights were almost exclusively from northern Europe: Maritain, Gilson, Congar, de Lubac, Schillebeeckx, Bouyer, Rahner, von Balthasar, Ratzinger, Küng, etc. Without these monumental figures, the rich teaching of Vatican II would never have emerged. But something of crucial importance has happened in the years since the Council. The churches that once supported and gave rise to those intellectual leaders have largely fallen into desuetude. Catholicism is withering on the vine in Holland, Belgium, France, Germany, and Austria. Meanwhile, the center of gravity for Christianity in general and Catholicism in particular has shifted dramatically to the south, especially to the African continent. In 1900, there were about 9 million Christians in all of Africa, but today there are upwards of 500 million, accounting for roughly 45% of the total population of the continent. And these numbers and percentages are likely to grow, since Africa also has one of the fastest rates of population growth in the world. So though it is perhaps still a German instinct to seize the intellectual high-ground and cast a somewhat patronizing gaze at the churches of the developing world, it is easy to understand how the leaders of those churches might remain politely — or not so politely — unwilling to accept criticism from their European colleagues. I would argue that the German editor has, in point of fact, misdiagnosed the situation rather dramatically. The Church is growing in Africa, not because the people are poorly educated, but because the version of Christianity on offer there is robustly supernatural. As Philip Jenkins and others have shown, African Christianity puts a powerful stress on the miraculous, on eternal life, on the active providence of God, on healing grace, and on the divinity of Jesus. If such an emphasis is naïve, then every Biblical author, every doctor of the Church, and every major theologian until the nineteenth century was naïve. The reason a supernaturally oriented Christianity grows is that it is congruent with the purposes of the Holy Spirit, and also that it presents something that the world cannot. A commitment to social justice, service of the poor, and environmentalism is obviously praiseworthy, but such a commitment could be made by decent atheists, agnostics, or secularists. Though it follows quite clearly from a supernatural sensibility, it is not, in itself, distinctively Christian. Accordingly, when Christianity collapses into purely this-worldly preoccupations — as it has, sadly, in much of Europe — it rapidly dries up. Something very similar obtains in regard to the priesthood. I would contend that vocations are thriving in Africa, not because African young men have so few professional options, but precisely because the African theology of the priesthood is unapologetically supernatural. If the priest is basically social worker, psychologist, and activist for justice, as he is, too often, in the European context, he loses any distinctive profile; but if he is mystic, soul doctor, healer, and steward of the mysteries of God, then he will present a compelling and attractive profile indeed. I would recommend not spending a good deal of time mulling over the resentful and wrong-headed musings of the German editor, but I would indeed recommend a thoughtful consideration of the pivotal European theologians of the Vatican II era. And I would most warmly counsel careful attention to the voices of the vibrant Church of Africa.